Tile roofing will give your home a whole new look. When thinking about a new roof, there are plenty of options for you to choose from. From asphalt to slate, there are plenty of options for your new roof. But what about when you want something that is both durable and beautiful for your home? Let’s take a look at some tile roofing materials you could choose for your new roof. 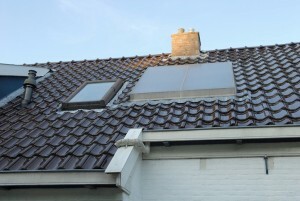 Ceramic tile roofing is often used on brick, stone, and wooden buildings. These materials are made of different varieties of clay, which are mixed in certain proportions. The clay is then heated and the color is evenly distributed. There are currently three different types of ceramic tiles on the market: flat, undulating, and grooved. Ceramic tiles are fireproof and can withstand exposure to the sun and extreme temperature. They also offer good heat and sound insulation. Many companies offer a color glaze to their tiles, which can be found in blue, white, green, yellow, orange, and many other colors. Concrete tile roofing is made of cement mortar and is made by mixing the mortar, forming the tiles, and adding color. The tiles are then dried and once the process is complete, they are allowed to age for one month. Unlike other roofing materials, these tiles are eco-friendly and only use a chemical for a pigmenting agent. Concrete tiles are durable, strong, frost resistant, and good at insulating against sound and heat. These tiles do weigh a lot, which might mean your home has to be enhanced to withstand the weight. Bituminous tiles, often referred to as flexible tiles, are made out of a fiberglass or canvas material that is made out of bitumen-impregnated cellulose. Each of these tiles is covered with granite or basalt chippings which protect the outside. These chippings provide extra protection and strength. These times provide your roof with durability and strength. If you choose bituminous tile roofing, your roof should not be sloped by more than 12 degrees. Composite tile roofing is a newer roofing material and is a kind of metal tile. These tiles have a multilayer structure to them made of a thick steel with a coating of zinc and aluminum. Acrylic polymer coating is applied to the surface of the tile with stone chippings. This gives the stone the effect of a natural stone tile while increasing the mechanical strength. This beautiful tile is also covered with an acrylic primer to protect the metal against corrosion. These and many other tiles will give your home the beauty and protection you are looking for. For more information on different tile roofing materials or having them installed, call Absolute Home Solutions today! This entry was posted on Wednesday, June 29th, 2016	at 9:07 pm	and is filed under Roofing . You can follow any responses to this entry through the RSS 2.0 feed. You can leave a response, or trackback from your own site.